As I was taking my seat for The Well the Andy Pitkin within surged to the surface. “Don’t like it,” I muttered as the cast groped each other in a pre-match huddle, moaning and humming. And they hadn’t even started the play yet. This was ‘physical theatre’, and my fear that this might have some relation to dancing’s evil cousin, ‘dance’, were being confirmed. Equally inauspiciously someone had mentioned to me that the writer and director, Jonathan Brown, sets all his work in Woodingdean. For anyone familiar with the suburbs of Brighton & Hove this, too, seemed unpromising. More than two hours later, though, I left the New Venture a convert to physical theatre, at least on this occasion, and with the satisfaction of having seen a gripping political thriller. 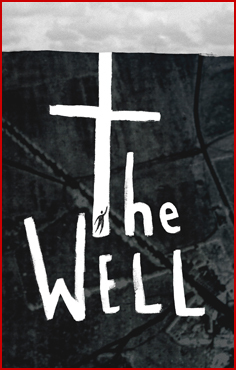 The Well is inspired by a nearly forgotten piece of Brighton history. The Woodingdean Well, started in 1858, still holds the record as the world’s deepest hand-dug well. At 1,285 feet it was taller than the Empire State Building, though going in the opposite direction, obviously. The plan was that it would supply water to a new workhouse and a school. On the face of it a worthy social project, funded from the rates. Hands were hired from another local workhouse, digging commenced, and four years later, going at the rate of a foot a day, they eventually reached water. Though after all that it was never actually drunk. This is reflected at the end of The Well when, invited to toast their success in the fruit of their long drudgery, the workers are unable to drink. In the Marxist sense they are alientated from their labour. Yet what the play is good at is demonstrating the palpable reality of the labour, and the meanings given to that labour by the workers themselves. These are counterposed and even, it’s suggested, challenge the commercial meanings of the well, which, as it turns out, aren’t quite as charitable as they are presented. In an apparent subplot one of the diggers, Jack, is also digging into his own past to find out how his mother died. This investigation takes him into an underworld of prostitution. The programme notes that the Spanish word for whore, ‘puta’, derives from the Latin term for a well. He discovers there the truth about the well, that it’s a scam invented by a corrupt network of bosses to profit from public funds and the exploitation of workhouse labour. And there’s a connection, too, to the death of his mother. Brown stages the final showdown between Jack and his mother’s killer in the well itself, at the moment that water finally bubbles up from below, and the pair race to the surface ahead of the deadly tide. All done with three ladders and some scaffolding, all there is to the set. It’s a strong narrative, and in many ways a modern and familiar one: the individual victim of a web of corruption tracking down and confronting the villain at the top. It’s a familiarity that makes the production’s techniques of defamiliarisation more credible. The actors – Leanne McKenzie, Julie Monkcom, Paddy O’Keeffe, Ali McKenzie-Wilcox, Warren Saunders, Mark Green and Brown himself – share the characters. Nearly everybody has a go at doing Jack which helps to universalise the individual experience. Sometimes two actors play the same character at the same time, in the case of the bad guy boss to appropriately monstrous effect. They also play objects: a bowl, a dressing table, a tunnel. All of which could be off-putting. But it isn’t. The viscerality of this physical theatre helps deliver the power of the story and, after only a few minutes in the company of an enthusiastic and good-humoured cast, seems a perfectly natural way to do it.